Ruth began her research with The National Bison Association of America, The Canadian Bison Association, and The Texas Bison Association. With their help, she discovered a Colorado man that had collected buffalo hair for three years. He agreed to sell his 1000 pounds to her, so she donned her jeans, flew to Colorado and purchased his lot. Ruth shipped the buffalo hair from Colorado to an east coast plant to be cleaned. Remarkably, 1000 pounds of buffalo hair was the minimum order required by the mills for processing. That 1000 pounds of hair eventually yielded 377 pounds of down. Ruth remembers "It took months to find a mill to do what I wanted. With our first production run, hats flew into the air and yelps of revelry were heard throughout the mill. The workers had such excitement and pride in their success with this new exotic yarn! It was the first solid return on the merits of my idea. I'll never forget the encouragement of that moment...it was a turning point in my vision." Buffalo hair is acquired one of two ways; either hand gathering tufts shed onto trees and bushes in the spring, or by shaving. Each animal yields 4 to 5 pounds of hair. Our American Buffalo Products are made from the soft undercoat of the American Buffalo and processed in the first and only complete buffalo hair processing plant in the world located in Wynnewood, Oklahoma. The plant cleans and de-hairs the bison hair producing a wonderfully soft down that is then spun into yarn for hand knitters and carded into rovings for hand spinners. The rest of the down is sent to the larger commercial spinners to spin yarn for finished products. 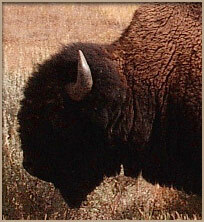 The bison has about five different kinds of hairs - the down and the various grades of course hairs. Most of those course hairs are separated from the down by the de-hairing machines in the plant. The plant has scouring machines, drying racks, picker machines, dehairing machines, carding machines, draw frames and spinners and plyers for yarn making. Buffalo has five different kinds of hair. Ruth's processing removes nearly all the coarse outer hairs and leaves the soft, downy undercoat. "It was the first time the coarse hairs had been commercially separated from the downy fleece" Ruth offers. The result exceeded her expectations by producing a rich, soft cashmere-like yarn in a deep earthy brown.